Since I finished the borders on DD1's twin bed quilt, I had to get the backing ready for the quilter. I chose a stash fabric that I have been wanting to use for 3-4 years. It's a Lakehouse fab and sooo fun for a 7 year old. So now I have busted 6 yards from my stash just with this backing. I was quite productive this weekend, course it rained a lot here. It was also a great couple of days from the mail. These little cuties arrived from Raggetty Old Annies....Nicole makes them sooo cute. I bought 2! So my Annie family is growing. I think I am going to name them....hmm what should I name them? This is part of my Hancock's order. I had ordered a book too...but it came damaged due to the sloppy way they packaged it. Have any of you had that problem with Hancock's? I love their closeout prices but the shipping is borderline. Anyhow....for $4 a charm pack...it was still worth it. Like I said a week ago..I had pushed buttons...but it was ALL on sale and I have plans for all of it. Frankly it makes me happy. Now back to my husband, he's getting better ....but we don't know when he will be released. In the mean time...I am sewing to keep my mind off things. Oh and baking with the girls too...DD1 decorated the cupcakes. They are yummy. Ok I was kinda bad again...I pushed buttons yesterday. I did. Nicole at Raggetty Old Annies posted new girlies on her site. I usually miss out on them...but not this time. I am so pleased to be getting not one but 2 little 11 inch girlies...now where will I put them? I can't wait to post when they arrive. 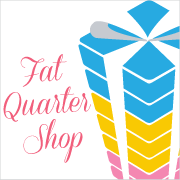 Oh but that was not all....no that's not all....I pushed buttons at the Fat Quarter shop too.....I have been holding for 2 weeks and just decided I was going to get some stuff I've been wanting. There are some new fabrics...but believe it or not I needed some border fabrics to use with my new Smores layer cake. I am half done with piecing the quilt made with that fabric. Plus I bought some Posh...mottled pink since I have 4 charm packs and will be needing borders for the quilt made with those. 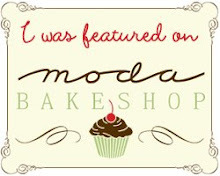 I joined the Cupcake swap on Sharon's blog..I am sooo excited. So now I am off to square up some 9.5 inch blocks....like 40 of them....yuck. Btw...check out the pincushion giveaway at You go Girl and be sure to mention you heard it from me! 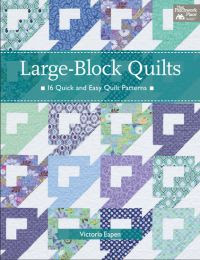 I would say that Big Blocks, BIG Quilts is a great book...the best I have seen for layer cake quilts. Now as I was saying...candy...I mean cake, yes cake....Well this book sums it ALL up..."Let Them Eat Cake"....yummy pincushions galore...and quilts, tabletopper, pillows, recipes!!!!! I can't wait to delve into one of these projects...Btw..it has 2 front covers....it's what I call a 'flip' book...not sure what the technical name is...anyhow...it's cool. 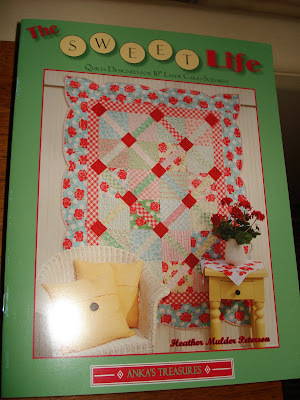 SO now I have another project to quilt. Oh and I made this tabletopper from the book by Anka's Treasures...it's new...but I modified the pattern because I only had FQ's and so I made the length..22 inches and the center strip is 6.5 inches instead of 8.5 in the book. And last but certainly not least, I DID finish my Mystery BOM from the Fat Quarter Shop! I've got about 5 or 6 other projects in different stages. I hope to make some progress on them this week. Today I am trying to work on my tumbler quilt, a new table topper, and the mystery BOM from the fatquartershop. Wish me luck! Check out Jackie's blog . 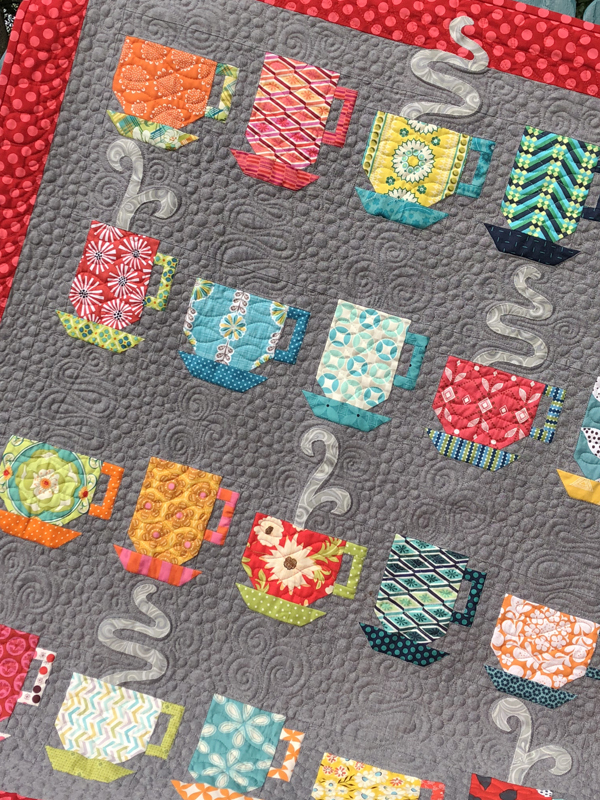 She's being very generous to giveaway quilting service for a twin quilt!! !Can you say wow? 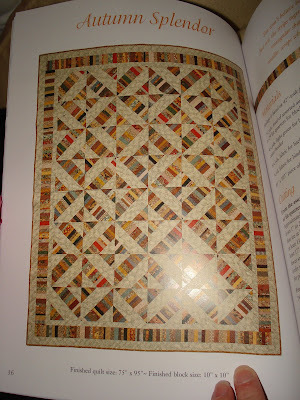 AND she has a very interesting blog...I love her inspirational quilts. Today we had a great time. My sister and I and our 2 seven year old daughters went to the Ripley's Aquarium and shopping at the Celebrity Circle shops... We managed to check out the build a bear workshop....and a few gift stores. Here's my DD with her loot. This is a just a view of the outdoor shopping....we fed the ducks and the fish. Ended up at an Arcade collecting tokens. 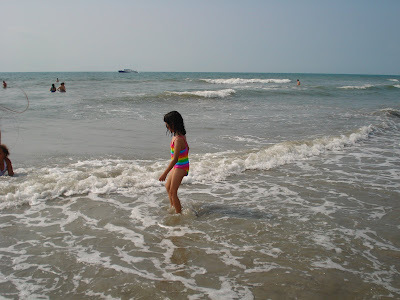 It was like Chucky Cheese at the Beach! On our way home...I decided to stop at a quilt shop that was new to me. Sewin' in the Carolinas is a large store with great variety. All around shop...I can see why it has lasted. I just snagged a roll of Moda Daydreams...and I love this quilt done in that fabric...so I asked the gal to snap my photo here...little did she know...I was trying to remember how they put this quilt together with the jelly roll. I mean it's suppose to be vacation but all the driving to get here hardly seems worth it. Doesn't do much for stash reduction but there ARE 2 quilt shops to visit...so I can't complain. 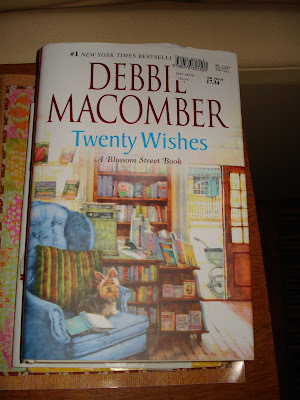 AND I did read half of "Twenty Wishes" in the car and did some hand sewing. Thus far "Twenty" is a good read. I'd like to make 20 wishes...hmm..maybe I will! I picked a couple of 'other' books at the local quilt shops yesterday...come on, did you think I wouldn't go?? LOL Well I LOVE Anka's Treasure patterns and books and this one is no exception. There are patterns for layer cakes in this one. I recommend it! I also bought Strips and Strings. A gal I know bought this back in Ohio and I have searched several places for it. I almost went to Amazon to buy it! This particular quilt done in Simplicity by Moda was a featured quilt at another local quilt shop. Jane was in love and I liked it too....but I found 3 or 4 other quilts I'd like to make from this book. 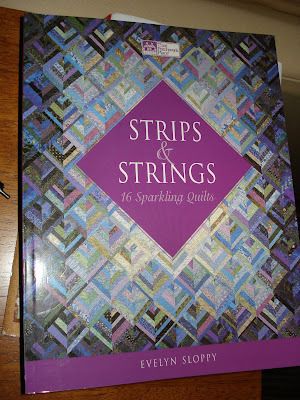 I have been trying to limit my purchases to quilt books that have 3-4 projects I like...instead of just one. While we were out shopping we found a store called CATO. I was really interested in their outfits, and was astonished to find 5 shirts! and a pair of jean capris. There were so many great clothes there. I wasn't even looking for anything in particular but I found some great summer tops. I think they will be good for work. Oh and we DID get to the beach today...it was sunny and 90 degrees. Then we went to my friends' house and swam in their pool. Even my parents swam. So far it's been a great trip! My pictures are not that fab but I am just pleased that "something" we planted is growing. DD1 and I picked these out and her and my husband planted them. I am not a green thumb,...nor care for outside much....so I leave the gardening to them. I have several other flowers that I can not wait to bloom...perhaps even some cut flowers..oh joy!